Has anyone ever heard of these guys or about their ovens quality? Looks kind of intriguing, features-wise, temp-wise and mostly price-wise. Wow, that's cheaper than a toaster oven! The temperature maxes out at around 650F which is basically what most deck ovens and Bakers Pride Countertops will do. And the voltage is 240, so it will perform well. I know the price is a very good one but it's also wholesale without a middleman. I contacted the company and the guys said they also do retail and are willing to ship to basically anyone, business or residential. They will also do a 110V/60Hz version upon request at no additional charge. 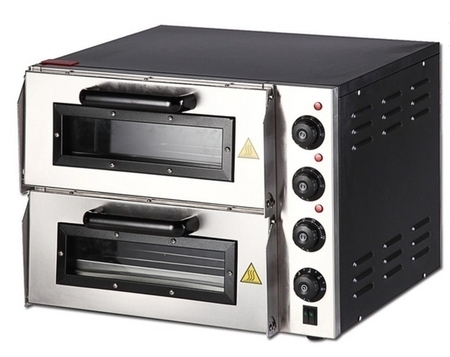 The same oven runs $520 on Aliexpress.com w/free shipping which is basically the Chinese version of eBay. I'm more concerned about quality and the way it's wired. Don't want to have sparks flying out of one of the temp controllers at some point. The reason I'm looking at the ovens is for the planned pizza-pop and if they work nicely then at least I got my money's worth. Forgot to mention that a good friend of mine, who runs and owns a Neapolitan pizzeria up in Toronto ordered a Sage brand electric pizza oven off of Aliexpress three or four years ago, also Made in China. Interesting. I bet it will be fine. I'm guessing it will be similar to computer monitors. High end ones can run a thousand dollars, but you'll also find Asian models with similar specs for $300. It's seems super sketchy, but I know people who've bought them and have been very happy. Let us know if you get one! Also, how much is shipping?